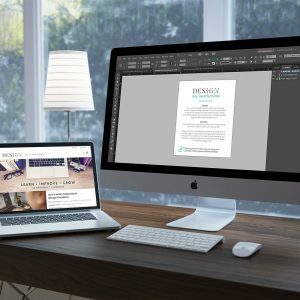 Just starting out in design and not sure how to setup common documents like business cards and letterhead? Or maybe you want to save the time of setting them up and enjoy easy to access documents that are ready to design. Grab these 4 essential blank templates and you are ready to go! Blank templates provide a base allowing you to go back and use them again and again at the start of your design projects. Never again start from scratch, worry about size or bleeds on the items you find yourself creating all the time. It’s all set and ready to design.